Happy Monday and Happy June! 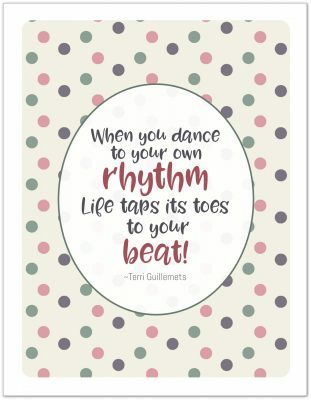 I’m so excited that June is finally here, I am ready for the boys to be out of school and the lazy dog days of summer to begin. Of course our days are not really lazy, but one can dream right? You know what else has me excited for June to be here? 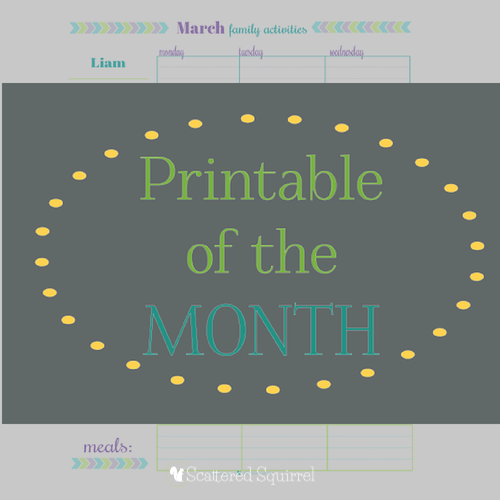 A new month means it’s time for a new Printable of the Month, and I’m super excited about the ones I have for you this month. 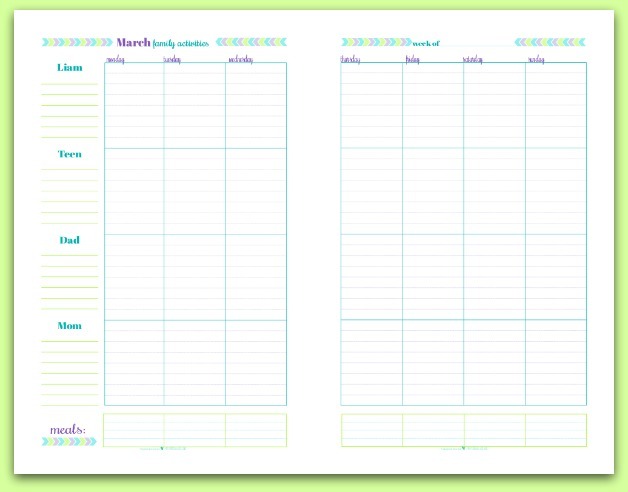 This month I’m hoping to help you keep track of what going on with your family with personalized family schedules! 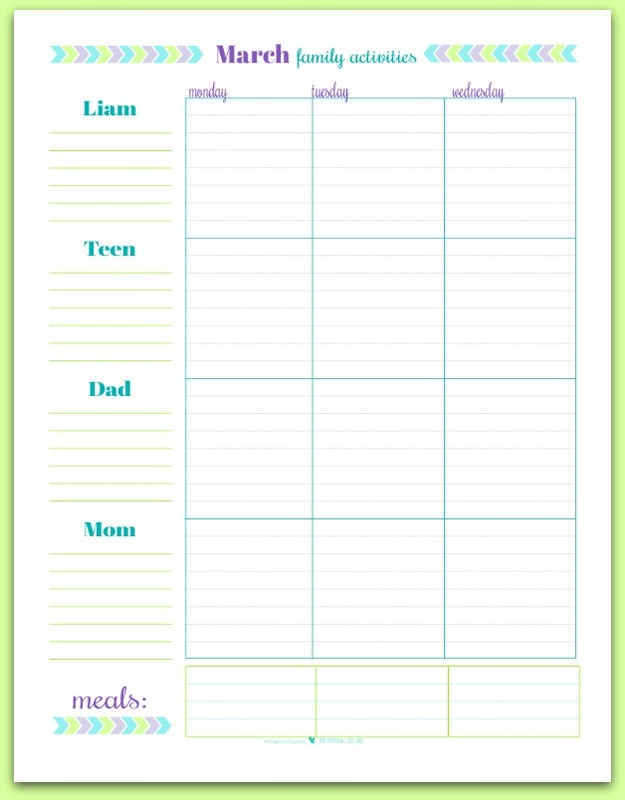 These family schedules are designed as a two page planner to that you have plenty of room to jot things down. Assign each family member a section so that you can easily see who is doing what each day. I included a space to jot down reminders under each name, and as you can see, at the bottom there’s even a spot for jotting down your meal plan for the week. Aaaaand there’s a half-size option! All you need to do get your copy is to fill out the form at the end of this post. All the options are there, and if you ever have any questions about the printables feel free to use the comment section of the form, or send me an email, or leave a comment on the post. And because I know that not all of you want the personalized option, here are the generic, fill in the blank options. Just simply click the picture to down load the one of your choice. The personalized options will be available until July 2nd, 2014. So what do you think? I would love to hear your thoughts! I’m linking up at these fantastic parties. 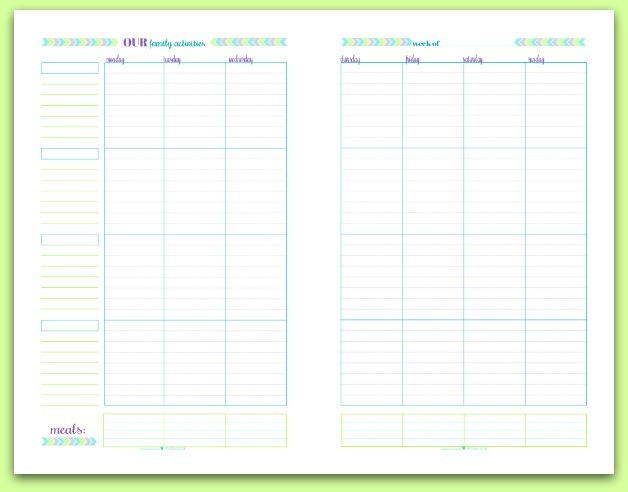 I just LOVE the “blank our week half size” printable!!! I was wondering if something could be tweaked on it that would help my organization greatly. Is there a fee? I use this as a horizontal full page and am ok with the gap in the middle. But I was wondering if instead of the header area with the week and our family activities line could be removed and replaced with what is at the bottom. (The meals section) I still want the meals section but would like it at the top and bottom if possible. 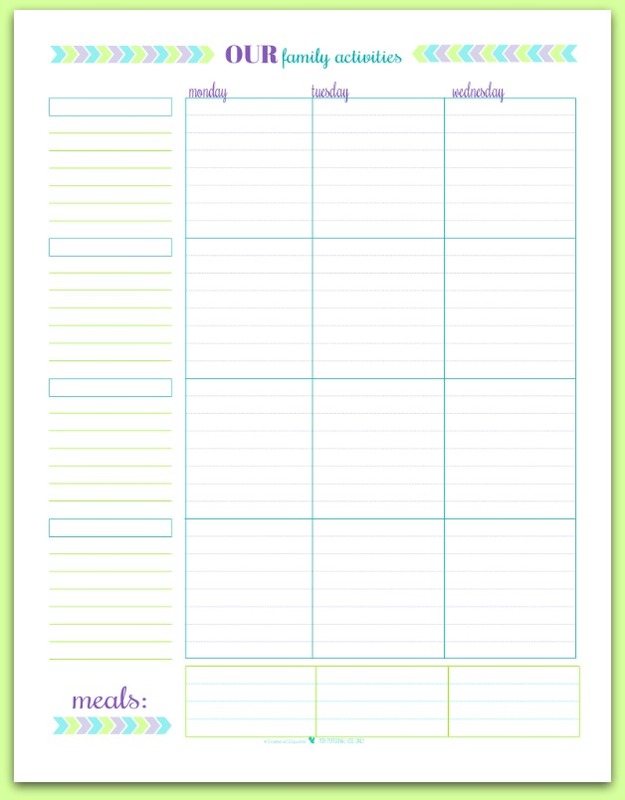 (it doesn’t have to be labeled meals) If it can’t be the full 4 lines that is ok.
I’m using this personally for business and personal organization and am using the bottom for places I have to go that day and want to use the top for tasks I’m batching to certain days. I can totally help you out. Send me an email with all the details you require and we can go from there. Hi Alli! I’m loving your beautiful two-page weekly schedule and am also wondering about slightly tweaking it. I don’t know if you’re willing to permit me to change it or if you can help, but I’m looking to track my water and MITs (Most Important Tasks, or My Top 3 daily) at the top of each day and also shift meals up. I could handwrite these in, but it would completely defile the beauty (and simplicity!) of it. Let me know if you can help, and thank you for making so many amazing tools available for public use! Hi Debbie, I’m actually working on something like this for closer to the new year. 🙂 I’m always open to suggestions and requests, I just can’t guarantee when or if I’ll get to them all, but I keep track of all of them. 🙂 Right now we’re extremely busy with planning and preparing for our move, so look for these to come out sometime in November or December at the latest.